We manufacture a variety of flooring styles in species not limited to oak, maple, pine and ash in a variety of widths and thickness. 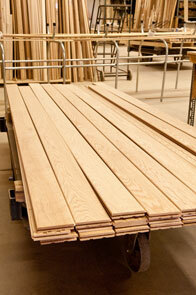 Wood flooring is made in lengths up to 11 feet with or without end-matching. Widths range from 1 ½ inches to 7 ¼ inches depending on your needs. We also produce a wide range of floor trims covering all types of flooring from solid ¾-inch thick to all of the laminates available in today's market; Bullnose, T-Mould, Carpet Reducer etc. Our quality manufacturing process means no shrinkage and little sanding prior to finishing.